Aerona Berendas is a Dunmer who can be found in Quarantine Serk. She is Dethisam Berendas's sister. Ornis Verobar is her uncle. Aerona Berendas: "There you are! It's about time you got here." "Where have you been? I've been waiting for you to arrive for days now. Hold on. Are you all they sent?" I'm not sure what you're talking about. Maybe you should start at the beginning. "Didn't the Tribunal send you? Well, no matter. I'm just glad you're here. This is Serkamora—the Serk. The Llodos plague reached us right before the Maulborn arrived. They claim they're here to help, but I don't trust them." "In all the confusion, I'm embarrassed to admit that I lost track of my brother, Dethisam. He's the town consul. Yesterday, he went to check on the townsfolk afflicted by the plague, but he's disappeared. Can you help me find my brother?" I'll help you find your brother. "Someone in town must know what happened to Dethisam. He loves to visit and chat with all of our neighbor. Come on. The sooner we find my brother, the sooner I can start thinking about dealing with the plague." Oh, by Vivec! Where are my manners? Of course. That's the least I can do since you agreed to help me find my brother. What would you like to know?" You called your brother the town consul. What does that mean? "As the ranking member of House Redoran in this town, he's more or less the one in charge. He's good at it, too. The townsfolk look to him for leadership and advice. And, truth be told, so do I." "The Maulborn? They're a fairly new sect, as far as I can tell. Part mercenary group, part compassionate charity. They've been helping those afflicted by the plague. They showed up here and set up a quarantine. And now they claim they have a cure." Tell me about the plague. "They have members from across Morrowind. And they're always looking for new recruits. I heard one of them speak in Kragenmoor. Lot of nonsense, if you ask me. Nostrum Breva is in charge at the quarantine, and she's the one handing out the curative." "You haven't heard about the Llodos plague People get sick, turn violent. Some claim they become monsters, but I haven't seen it. At least not yet. The Maulborn have a cure. They promised to fix this. That's why we let them set up their quarantine." Aerona Berendas: "Grell? Grell, are you in here?" "Look at this place. How could Grell let it get this bad? He was never what you'd call neat, but he wasn't a slob, either. He stocked up on the Maulborn curative, gathered his friends, and was going to ride out the plague. I wonder what happened?" "Grell is a friend of my brother. I wonder why he hasn't come to welcome us? And look at all the empty bottles of curative. How could these people consume so much and still be so ill? Let's search the house and see if we can find some sign of Grell." Aerona Berendas: "By the Tribunal! Grell!" Aerona Berendas: "Grell, please! We're your friends!" Aerona Berendas: "Poor Grell. What in Oblivion's name happened to him? Let's get out of here." "What happened to poor Grell? Is this what the plague does to people? How horrible!" "Don't, please. I'd rather not talk about it. But how could something like this happen to Grell? He was always so healthy! And look at all these empty bottles. Did he drink all of these curatives?" Aerona Berendas: "Uncle! Are you all right?" Aerona Berendas: "You look so pale. No wonder my brother wouldn't let me come by to visit." Ornis Verobar: "Don't worry about me. I'll be back on my feet in no time. But what about you? Your brother said that neither of you had taken the curative yet." Aerona Berendas: "Uncle, I'm not sure about these Maulborn. And their curative sounds too good to be true. But don't worry about me. Just take care of yourself." "What was my brother thinking, keeping uncle's condition from me. When we find Dethisam, he's going to get a piece of my mind. Right after I give him a good, swift kick." Maybe your brother was just trying to protect you. "Protect me? What a ridiculous notion! Who saved him from the rampaging nixes? Who kept those drunk Argonians from beating him silly? And who scared off Lady Hlaalu when she got so very tenacious? That would be me!" Aerona Berendas: "By the Three, this place smells terrible!" "Look at her! Bili usually keeps herself immaculate, but now she looks ten seasons older and like something the guar dragged in. Maybe she knows where Dethisam went, though." Are we in danger of getting sick? "I suppose anything is possible. But I haven't gotten ill yet. And you look as hale and fir as a guar bull, if you don't mind my saying so." "The sicker people get, the more incoherent they become. And now it looks like the rumors are true—the Llodos plague does turn people into monsters! I don't think we're ever going to find my brother." Maybe we should pay a visit to the Maulborn quarantine. "The quarantine? I guess it makes sense that Dethisam would want to go see what the Maulborn are doing in there. And I've yet to see any evidence that the curative works. All right. If you want to go to the quarantine, I'll go with you." Tell me what you know about the quarantine. "The Maulborn set up the quarantine around the old graveyard. In the beginning, they were letting people inside and freely distributing the curative. But they closed the front gate a few days ago and haven't responded to any of our requests." Any ideas on how we can get in there? "Dethisam provided them with the old graveyard key when they first arrived, and I've seen Maulborn coming and going through the back gate. If we go to the back gate, I'm sure we can get one of the Maulborn to let us inside." "The back gate is around the left side of the quarantine fence. If the Maulborn are using that old gate, then one of them must have the graveyard key." Approaching the back gate to the Serk graveyard, the Maulborn Healer and Maulborn Enforcer standing in front of the door attack you. Aerona Berendas: "Look! It's just like I told you. The Maulborn are using the back gate. Let's see if one of them has the key." Aerona Berendas: "Hey! What are you idiots doing? Do we look like plague husks to you?" Aerona Berendas: "Did you see that? They attacked us! And for no good reason! Let's find the key and see what the Maulborn are hiding in there." "That key should open the old gate and let us into the quarantine. Let's go see what the Maulborn are hiding in there." "Plague husks? Here? Where did they all come from? Are these really all the people that came here looking for help?" Those afflicted with the plague turn into husks, right? Do you recognize anyone? "They barely look like Dark Elves anymore, and it's hard to tell one plague husk from another. What could the Maulborn be doing out here? And for what purpose? And what do you suppose was in all those crates?" "When the Maulborn arrived, they brought dozens of crates and boxes with them. I thought they were supplies for making their curative. But now that we're in here, I don't know what to believe." Aerona Berendas: "By the Three, this place chills me to the bones. Let's see if we can find my brother and then get out of here." "I never really liked this place when it was just a crypt, but between the quarantine and the plague husks it's gotten so much worse. Let's get moving. The sooner we figure out what's going on and find my brother, the sooner we can get out of here." Aerona Berendas: "Those nix fleas promised they would help. They promised they had a cure!" Aerona Berendas: "All right, then. Now I feel icky all over." "We should never have trusted the Maulborn. It seems like the curative isn't really a curative at all. It might even be the source of the Llodos plague!" The plague ... everything ... I think the Maulborn planned for this to happen. "The Maulborn planned this? I thought they were here to help! I knew we shouldn't have trusted them or their promised miracle cure." Aerona Berendas: "Dethisam? My brother, what happened to you?" Aerona Berendas: "By the Three! I fear the plague consumes you, brother!" Dethisam Berendas: "Aerona, what are you doing here? It's not safe!" Aerona Berendas: "The Maulborn attacked us, and the afflicted are turning into plague husks. Oh, Dethisam, this is dreadful!" Dethisam Berendas: "The Maulborn are spreading the plague. For some reason, they want everyone to become afflicted. They're not healers—they're monsters!" "My brother—the plague boils his blood and ravages his body. I fear he doesn't have much time, but he wants to talk to you." Maybe the Maulborn have a real cure. "Do you think so? However slim the chance, I guess we can't give up hope. Isn't that what one of the Three is always going on about? Or am I thinking of a Daedric Prince? No matter. Dethisam's not dead yet." We've seen what happens to the afflicted. "If Dethisam becomes a plague husk, then I'll handle it. He's my brother. But as long as there's a chance, we have to try. And if the worst comes to pass, I'll take care of it." Aerona Berendas: "Dethisam, you s'wit! We're not leaving without you." Dethisam Berendas: "I hope you know what you're doing. I could become a plague husk at any moment." I know you can take care of yourself. Just make sure you give these Maulborn a taste of their own bad medicine. For me." "Glad to see you managed to make it out of the quarantine, too. Does that mean those Maulborn fetchers have been dealt with?" The Maulborn are finished. At least here in Serk. How's your brother? "Not well. Alchemist Nilyne fancies herself something of a healer, and she's been working with Dethisam and the other afflicted. Hopefully, she'll devise a treatment for them soon." Is the alchemist making any progress? "Some. She seems confident, at least. But what do I know of draughts and elixirs? But tell me, do you think the Maulborn pose a threat to the rest of Deshaan?" I'm not sure. It certainly sounds like their plans included more than just the Serk. "That's what I'm thinking as well. But maybe your efforts were enough to put an end to all that. For now, at least, the Serk is safe. Take this as a tank you for helping us." "So tell me, my friend. Do you think the Maulborn pose a threat to the rest of Deshaan?" I'm not sure. It certainly sounds like Serk was just the beginning of what they had planned. "The Maulborn have been dealt with, but I could use a little more of your help, if you don't mind." Of course. What do you need? "It's my brother. He's still ill and his condition has taken a turn for the worse. Nilyne is working to develop some kind of treatment, but she could use your assistance. She can't work at her alchemy table and also gather the components she needs." "Talk to Nilyne. Let her know I asked you to assist her. She can be a little aloof, but she'll tell you what she needs you to do." I'll talk to Nilyne right now. "I appreciate you doing this for me. Talk to Nilyne. Just try to ignore her sharp tongue and insulting tone. That's just her way. She really is an excellent alchemist. My uncle trained her, you know." "I knew you'd find everything Nilyne needed! Please, talk to the alchemist and give her the additives she's been waiting for." "Please, hurry! I know you can do this. I have faith in you!" "I knew you [sic] figure it out! Please hand the potion to Nilyne so she can inspect your results." Nilyne Hlor: "All right, that's it. Visiting time is over. Everyone out and let my patient rest." Ornis Verobar: "You heard the lady. Let's go wait outside." 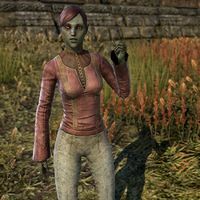 Aerona Berendas: "Please, Mother Morrowind! Please help Dethisam get well!" Ornis Verobar: "Nilyne knows what she's doing. Dethisam will be fine. You'll see." "I don't know how to thank you. Without your help, the Maulborn would have destroyed the Serk." We did everything we could. And Nilune seems to know what she's doing. "I know. His fate is in the Three's hands now, but he certainly has a fighting chance—thanks to you. Here, take this. There's no way I can truly repay you for what you've done for the Serk, but it's a start." Nilyne Hlor: "I'm happy to say that the suppressant works. It's not a cure, but it should buy me the time I need to find a way to beat the plague." Aerona Berendas: "That's wonderful news! If I wasn't worried about spreading the plague, I'd kiss you right on the lips!" "About what I said. About kissing you on the lips. You know, that was just heat of the moment, right? Anyway, thanks again for your help." For some reason, Aerona has 100 hp. If you choose to leave Dethisam in the Catacombs during Bad Medicine, Aerona will become the town consul, and Dethisam will die. Ornis Verobar will be Nilyne's patient during Quest For the Cure in this scenario. This page was last modified on 12 March 2019, at 22:04.